The Secret Smoke Success Tips is a must read book for anyone who has ever wanted to have a great looking smoke system. These tips work with ALL commercially available and home made smoke systems. Finally, the secrets of producing thick impressive smoke from your R/C model airplane are revealed in one complete informative booklet. Learn the tricks of the pro's and make your flying come alive with this treasured effect. In this book you'll learn the pro's and con's of all the different types of smoke delivery systems. You'll also learn how to select the perfect airplane, engine, propeller and covering material for smoke. Plus you'll also find tips on making your own smoke mufflers, secret smoke oil recipes, smoke pre heaters, programming computer radios for smoke, safety tips and much more. This booklet was written during the development of TME's very successful Simple Smoke Pump. 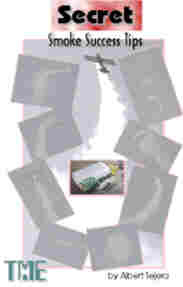 This smoke system and the secrets in this book went on to compete at the world invitational 1994 and 1996 Tournament of Champions Aerobatic Competition in Las Vegas. Used by world famous R/C pilots such as Steve Stricker,Jason Shulman, Wolfgang Matt, Peter Erang, Dave Von Linsowe, Mike McConville, Mike Klein, Geoff Combs, Gene Rogers, Bill Cunningham , Colin Campbell and last but certainly not least, the prominent David Patrick. Albert Tejera, president of TME and designer of the Simple Smoke Pump, takes you step by step in understanding and maximizing the smoke produced by model airplanes. He combines his experience as a modeler and the experience of smoke producing experts in the industry in a clear, easy to read style.